Considerably stronger than competing boron supplements. Utilizes ACS-Reagent grade active ingredients. Read instructions completely before use. Shake container before each application. The natural seawater concentration of boron is ~4.54 ppm; maintaining the boron concentration in reef aquaria within a range of 4 - 6 ppm is recommended. 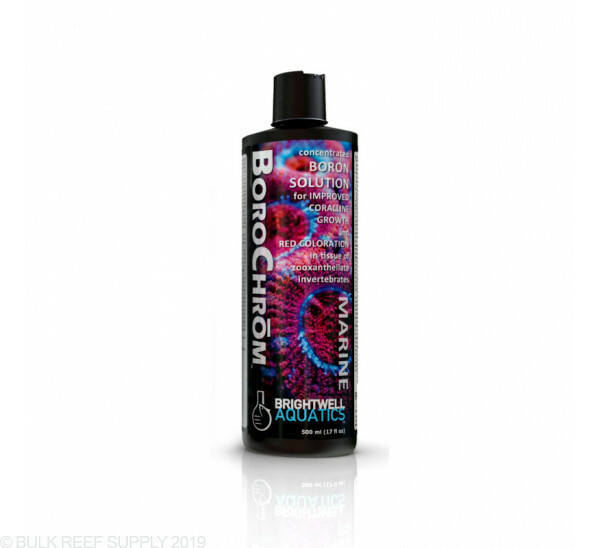 Enhanced red coloration in coral tissue may be observed when maintaining an elevated boron concentration, however attention should be paid to alkalinity and pH when using BoroChrōm for this purpose. Gradually increasing the boron concentration (by no more than ~1 ppm each day) will yield greatest stability of water chemistry and is strongly recommended. A maximum sustained boron concentration of 8 ppm is recommended. Changes in coloration may take 1 - 4 weeks to appear, and each colony will respond differently (some may not change color noticeably, depending upon base coloration, duration of dosing, and sustained boron concentration in system); results will vary. Determine the boron concentration in the aquarium system using an accurate test kit before supplementing. 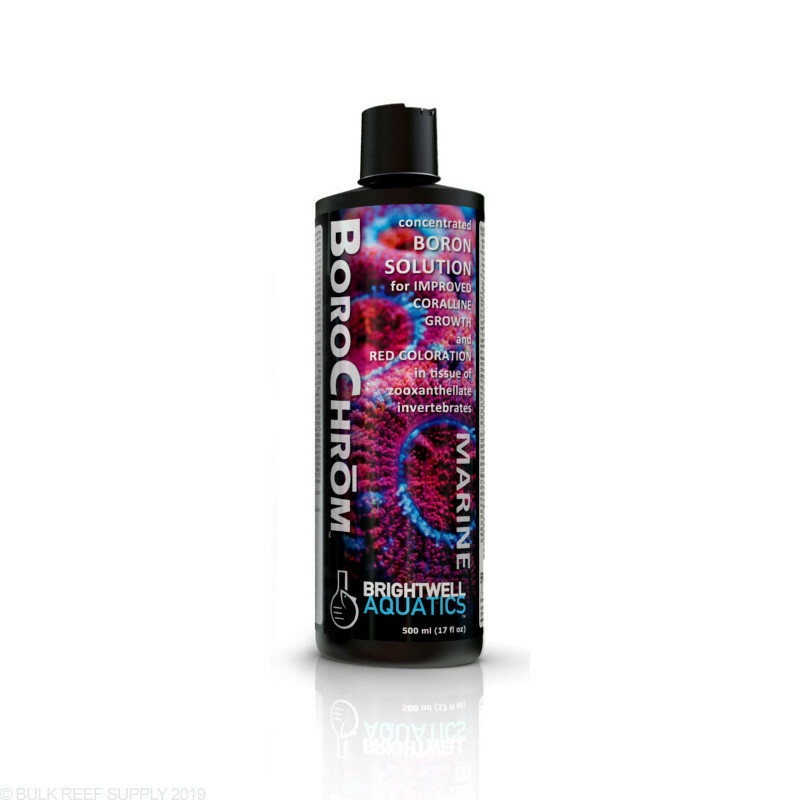 Each ml (~20 drops) of BoroChrōm will increase the concentration of boron ("[B]") in 1 US-gallon (3.785 L) of water by approximately 1.5 ppm (~0.075 ppm per drop). If the initial [B] in the aquarium is below 1.5 ppm, add this product at the maximum rate of 1 ml per 100 US-gallons daily until the boron concentration measures between 4 - 7 ppm, then dose daily or weekly as needed (see below). Always try to maintain the [B] within a range of +/-2 ppm. To determine the dosing rate of this product once the desired [B] has been acquired, measure the daily rate of boron uptake (i.e. the decrease in boron) in your aquarium by measuring the [B] at the same time each day over a one- to two-week period. To determine the daily dosing rate (preferable to weekly dosing) for boron maintenance: estimate the volume of water in the entire aquarium system; divide the daily decrease in [B] by 1.5; multiply this number by the volume of water in the system to get the daily dosage required (ml) to maintain a stable [B]. Daily dosing maintains a more stable [B] (and more natural environment) than dosing weekly, in which the [B] spikes just after dosing and then gradually decreases throughout the course of the week.